Hooch is fun and exciting with a wonderful taste that is crisp, fruity and fresh. 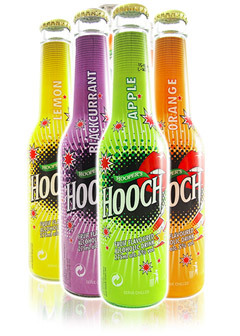 Hooch is currently available in four flavours – Apple, Orange, Lemon, and Blackcurrant. Each flavour enjoys the full taste of fruit and the cutting edge of premium vodka. Only the finest quality ingredients are used to produce Hooper’s Hooch, the world’s finest RTD. Hooch is supplied in 275ml bottles at 5% alc. and is packed in cases of 24 bottles. 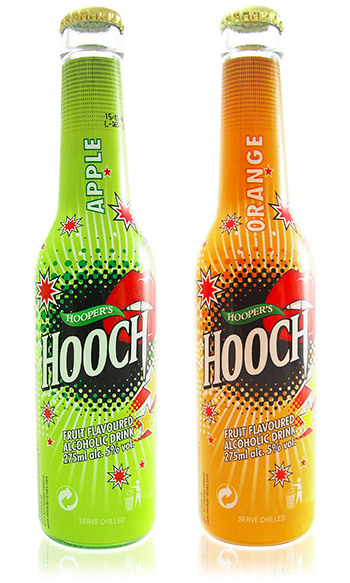 The original Hooch was launched in the early nineties as Hooper’s Ginger Brew, the product was very well received and after a period of development other flavours were introduced. Lemon was launched in the UK during 1995 and during 1996, Apple Hooch and Blackcurrant Hooch were also introduced. During 2004-5, the Hooch laboratory together with a leading European Flavour House, were commissioned to review and develop each of the Hooch flavours. The purpose of this activity was to provide the brand with the ultimate in taste, freshness and to incorporate a superb long lingering after-taste. A continuing development programme is designed to keep Hooper’s Hooch well ahead of all competition.